IBM announced a commitment to base all of its cloud services and software on an open cloud architecture. IBM said this commitment would help ensure that "innovation in cloud computing is not hampered by locking businesses into proprietary islands of insecure and difficult-to-manage offerings." Without industry-wide open standards for cloud computing, businesses will not be able to fully take advantage of the opportunities associated with interconnected data, such as mobile computing and business analytics. "History has shown that open source and standards are hugely beneficial to end customers and are a major catalyst for innovation," said Robert LeBlanc, IBM senior vice president of software. “Just as standards and open source revolutionized the Web and Linux, they will also have a tremendous impact on cloud computing. IBM has been at the forefront of championing standards and open source for years and we are doing it again for cloud computing. The winner here will be customers, who will not find themselves locked into any one vendor -- but be free to choose the best platform based on the best set of capabilities that meet that needs." 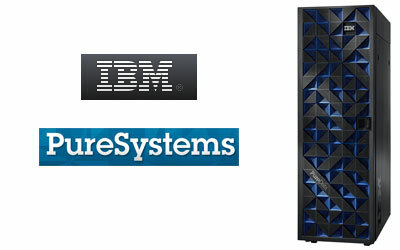 As the first step, IBM unveiled a new private, enterprise cloud offering based on OpenStack. The new software, called IBM SmartCloud Orchestrator, gives clients greater flexibility by removing the need to develop specific interfaces for different cloud services. With the new software, companies can quickly combine and deploy various cloud services onto the cloud infrastructure by lining up the compute, storage and network resources with a graphical interface. In addition, IBM also announced new versions of software that use open standards to help companies better monitor and control their enterprise cloud deployments. For example, IBM SmartCloud Monitoring Application Insight helps businesses monitor the real-time performance and availability of applications hosted on a cloud and being delivered via the Web, hosted on public cloud platforms and IBM SmartCloud. 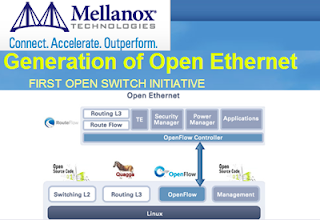 Mellanox Technologies is launching a "Generation of Open Ethernet" initiative to extend the power of Software Defined Networking (SDN) and serve as an alternative approach to traditional closed-code Ethernet switches. Mellanox Open Ethernet aims to eliminate proprietary software and encourages the development of an ecosystem environment focused on building Ethernet switch software to move innovation forward. Open Ethernet also includes the capability to fully customize, through the open code, a variety of open source management software packages, support standard OpenFlow controllers, and more. Open Ethernet is supported on Mellanox’s 10/20/40/56GbE switches, with forward compatibility to future Mellanox Ethernet solutions. "The current landscape of proprietary Ethernet switches limits the foundation of compute and storage clouds and Web 2.0 infrastructures. We are excited to facilitate change and to lead the new generation of Open Ethernet that will enable a more open and collaborative world,” said Eyal Waldman, president, CEO and chairman of the board of Mellanox Technologies. “Mellanox Open Ethernet allows users to gain control of their network and data center, and to achieve higher utilization, efficiency and return on investment, and will enable our customers to add differentiation and competitive advantages in their networking infrastructure. We have been seeing wide and strong support for this initiative from our partners and users, and expect to see a growing community around our initiative." Deutsche Telekom has formed a partnership with FON with the goal of offering pervasive Wi-Fi coverage in Germany. Fon currently supports more than eight million Fon Spots that comprise the world's largest WiFi network, with more than nine million subscribers. In Great Britain, France, Spain, Belgium, the Netherlands and Croatia, Fon customers share their broadband lines and, in return, they receive access to millions of WiFi spots around the world and free of charge. Fon also serves a large WiFi community in Brazil. Telekom customers who join the Fon community will be able to surf the Internet free of charge while visiting the Copacabana during the FIFA World Cup next year. Telekom currently serves 12 million broadband lines in Germany and has more than 12,000 hotspots. XO Communications launched a new Intelligent WAN service that combines MPLS IP-VPN, network security and applications performance monitoring in one unified solution. Intelligent Networking: Connect offices, data centers and branch locations while unifying employees, suppliers, and customers with seamless access to applications and services leveraging the intelligent networking capabilities of XO MPLS IP-VPN. This private, application-aware network service enables IT and network staff to prioritize applications and network traffic and build a more scalable network infrastructure that can easily add new locations and services with the intelligent routing capabilities of MPLS. Integrated Network Security: Monitor network threats and provide secure access to the network with round-the-clock surveillance and unified threat management capabilities of the XO Intelligent WAN’s integrated Hosted Security. With network security hosted in the XO cloud and fully integrated with the enterprise WAN, organizations can more cost-effectively provide network security for each location as well as implement uniform security policies across the network with robust firewall, web and content filtering, and secure remote access capabilities. "Increasingly, the executive suite is seeing the network as creating business value and being central to achieving business objectives. The XO Intelligent WAN can help IT and network staff plan better for tomorrow’s business environment by providing greater agility for exploiting market opportunities, delivering on customer-centric principles, and conquering the two biggest barriers to cloud services adoption: security and application performance," stated Don MacNeil, Chief Marketing Officer, XO Communications. TIA: Mobile Data Revenues Exceed Mobile Voice in U.S.
Revenue for mobile data services in the U.S. in 2012 exceeded those for mobile voice services, according to The Telecommunications Industry Association's (TIA's) newly released 2013 ICT Market Review & Forecast (MR&F). The report is compiled annually by TIA and provides a global industry overview along with chapters that offer a deep-dive into specific industry segments. In 2012, for the first time in the history of U.S. mobile telecommunications, more money was spent on mobile data services ($94.8 billion) than on mobile voice services ($92.4 billion). TIA predicts this trend will accelerate in the years ahead – with mobile data spend hitting $118.6 billion in 2013 (versus $86.4 billion for voice) and $184 billion by 2016 (versus $70.1 billion for voice). Additionally, U.S. wireless penetration jumped over 100 percent in 2012 – rising to 102.5 percent for the year. TIA predicts that wireless carriers will add 40.3 million subscribers over the next four years, for a penetration of 111.3 percent in 2016. In 2012, U.S. wireline spending was $39.1 billion, compared with $27 billion for wireless infrastructure. By 2016, wireline spending is expected to climb to $44.4 billion, while wireless will reach $38.4 billion. Meanwhile, overall spending on both wireless and wireline infrastructure will total $313 billion over the next four years (2013-2016) according to TIA estimates – an increase of 34 percent over the previous four years (2009-2012). 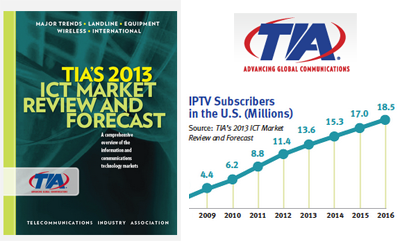 The overall telecommunications industry experienced 7 percent worldwide growth in 2012, down 3 percent from 2011. While growth actually accelerated in the U.S. (from 5.9 percent in 2011 to 6.2 percent in 2012), international markets saw a declining growth (11.3 percent versus 7.2 percent). TIA sees this trend continuing, with the overall industry growth rate in the U.S. surpassing growth in international markets in 2014. The MR&F predicts U.S. growth rates of 7.1 percent in 2013 and 6.8 percent in 2014, while international markets will see rates of 7.9 and 6.5 percent, respectively. 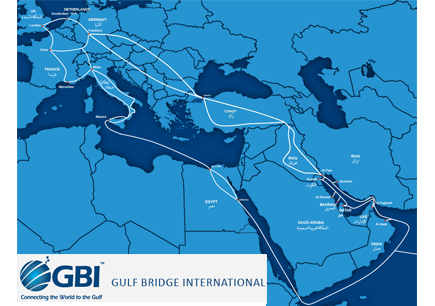 Gulf Bridge International (GBI) activated the first ever terrestrial fiber optic link connecting all the countries of the Gulf to Europe via Iraq and Turkey. The new GBI North Route provides connectivity from the cable landing station at Al Faw, in the south of Iraq, crossing Iraq and Turkey to Istanbul, and onward to Frankfurt in Germany. "GBI’s route through Iraq and Turkey represents a major milestone for both regional and international communications,” said Ahmed Mekky, Board Member and CEO of GBI. “This more direct route will lead to faster connectivity via lower latency times, and the diversity we offer will reduce the likelihood of a reoccurrence of the three day internet outages of 2008. This investment is in line with our vision to connect the world to the Gulf and strongly underpins the continued ICT development across a region home to one sixth the world’s population. In addition, Iraq is now emerging as a modern communications hub, with significant implications for the nation’s economy and long-term development." Xtera Communications introduced OTN switching capabilities on its 100G optical networking platform. 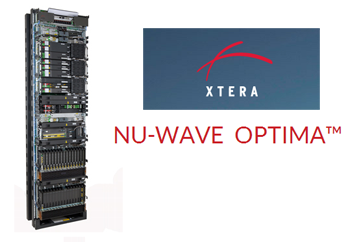 The Xtera Nu-Wave Optima now offers a stand-alone or integrated switching and transport solution. Benefits include scalable transport and switching capacity, efficient capacity utilization in backbone networks, high manageability on per service and per wavelength basis, fast service provisioning, quick failure protection, and policy-based restoration. The switching capacity is 2.4 Tb/s per shelf, upgradable in a hitless way to 21.6-Tb/s capacity in a single-stage switch fabric. "By introducing OTN switching to our best in class 100G and optical amplification technologies, Xtera positions itself as the supplier of choice for optical networking solutions offering capacity efficiency, resiliency and flexibility to handle any type of services for maximizing the revenues of the service providers,” said Philippe Perrier, SVP, Product Line Manager Long-Haul Optical Transport of Xtera. “With an innovative design for the core of our OTN switch allowing a maximum switching capacity in excess of several hundreds of Tb/s, Xtera confirms again its technical leadership by introducing new technologies and industry-leading capacity and flexibility." 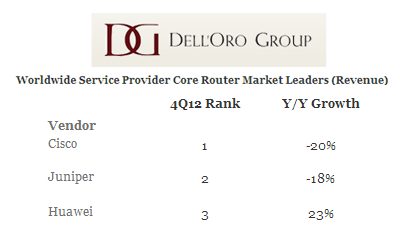 The service provider core router market declined for the sixth consecutive quarter in the fourth quarter of 2012, according to a new report from Dell'Oro Group. Market revenue fell to its lowest level since the third quarter of 2009 as network operators continued to shave investments in backbone networks. Cisco, Juniper, and Huawei were the market share leaders of the service provider core router market, accounting for more than 95% of fourth quarter revenue. Cisco remained the share leader with more than half of the market for the fourth quarter. Juniper was clearly the second ranked vendor, and Huawei made gains as the number three manufacturer. "For the past two years, we have seen many service providers prioritize investments for mobile and residential broadband networks and scale back core router purchases" said Shin Umeda, Vice President at Dell’Oro Group. 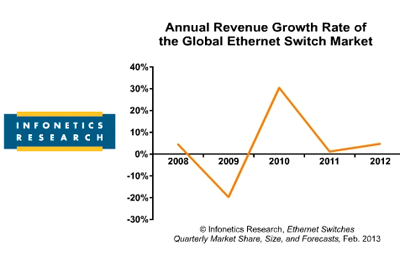 "We expect the core router market to rebound in 2013 as network operators rebuilding capacity with the latest generation of high capacity router," added Umeda. 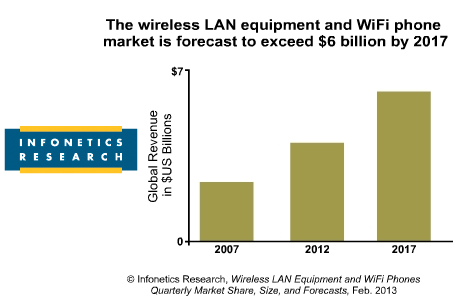 As the economy continues to rebound, Infonetics anticipates that companies will upgrade their core communication infrastructure, sparking growth of WiFi phones.